This stuff is rock solid. Litterally. This paste was so dense, I'm surprised they managed to keep it liquid. Seems to work as advertised. Since I used it on a new system, I don't know if it performs better than stock thermal paste or slightly cheaper thermal paste, but the reviews said it was the best one out there (for a not extreme price) and it does it's job as my CPU stays within acceptable temps during prime95 stress test. I don't have a direct measure how much this helped to cool down my CPU. But the combination of H100i v2, push+pull fan setup, and Kryonaut is able to keep my 6700K (@4.5GHz) below 60C underload! Best non-conductive paste currently available. Best thermal paste. Reasonably price if you don't do a ton of applications. If your water cooling it is a must have to hit the best temps. If it's available, buy the 11g version. You can never have enough Kryonaut. While I can't say how much better this performs than the stock paste, I will say that the actual thermal transfer rate of this stuff is insane. After reading reviews I couldn't buy anything else, I had to try it, no regrets here, $12 well spent. First time trying it out, I normally use artic silver 5. I like it alot and will probably go with this from now on. No words for this stuff! 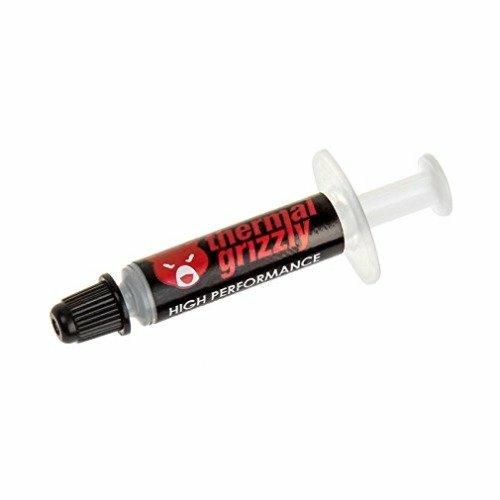 I never thought there was much of a difference in most thermal paste but Thermal Grizzly proved me wrong! This stuff is GREAT! It's a little hard to spread but warm it up in some hot water and it's easy as the rest! Really great product!